The American Civil War: A Military History , John Keegan, Knopf Publishing, 16 pages of photos, 12 maps, index, 416 pp., $35.00. October 20, 2009. 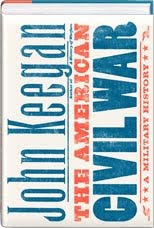 "For the past half century, John Keegan, the greatest military historian of our time, has been returning to the scenes of America’s most bloody and wrenching war to ponder its lingering conundrums: the continuation of fighting for four years between such vastly mismatched sides; the dogged persistence of ill-trained, ill-equipped, and often malnourished combatants; the effective absence of decisive battles among some two to three hundred known to us by name. Now Keegan examines these and other puzzles with a peerless understanding of warfare, uncovering dimensions of the conflict that have eluded earlier historiography. While offering original and perceptive insights into psychology, ideology, demographics, and economics, Keegan reveals the war’s hidden shape—a consequence of leadership, the evolution of strategic logic, and, above all, geography, the Rosetta Stone of his legendary decipherments of all great battles. The American topography, Keegan argues, presented a battle space of complexity and challenges virtually unmatched before or since. Out of a succession of mythic but chaotic engagements, he weaves an irresistible narrative illuminated with comparisons to the Napoleonic Wars, the First World War, and other conflicts. The American Civil War is sure to be hailed as a definitive account of its eternally fascinating subject. General Robert E. Lee was a complicated man and military figure. 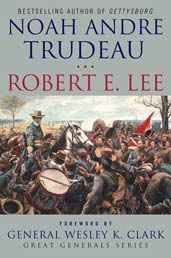 In Robert E. Lee, the 11th book in the critically acclaimed Great Generals Series, Noah Andre Trudeau follows the general's Civil War path with a special emphasis on Lee's changing set of personal values as the conflict wended through four bloody years and by exploring his famous skills as a crafty and daring tactician. Trudeau adds a fresh perspective toward understanding a major figure in American history who remains decidedly an enigma. "For a century after the death of Robert E. Lee in 1870, his image achieved iconic status in the South--and beyond. In recent decades, however, historians have discovered a flesh and blood Lee who is far more complex and interesting than the marble man of yore. Trudeau's fast-paced biography offers a well-rounded portrait of the real Robert E. Lee." Jeffry D. Wert, author of Cavalryman of the Lost Cause: A Biography of J. E. B. Stuart, "Noah Andre Trudeau's Robert E. Lee offers an insightful portrait of one of America's greatest generals. In a brisk narrative, Trudeau delineates the personal and professional attributes of the famous Confederate leader. A reader will learn much in these pages about a fascinating, historic figure." W. Todd Groce, President and CEO, Georgia Historical Society, and author of Mountain Rebels: East Tennessee Confederates and the Civil War,"A crisply-written and compelling biography of one of America's most celebrated soldiers. Trudeau's keen insights and considerable talents as a writer and historian make this book a must read for anyone wishing to understand Lee's remarkable military career and mastery of the battlefield." Forthcoming and Noteworthy: Did Blockade Runners Beat the Federal Navy and Prolonge the War? 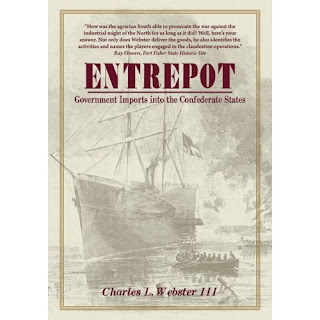 Entrepot: Government Imports into the Confederate States , Charles L. Webster III, Edinborough Press, 396 pp., $39.95 paperback. Examining . . . the history of civil war blockade running, this unrivalled compilation reveals the arms, equipment, and clothing brought into the Confederacy during the American Civil War. Detailed and comprehensive, this survey offers month-by-month, cargo-by-cargo descriptions of goods received at multiple locations across the United States. From Savannah, Charleston, and Wilmington to Matamoros, Galveston, and Mobile, this reference lists all distribution—the Belgian-made woolen cloth and English rifles that arrived in the farthest reaches of the Trans-Mississippi and the receipt of thousands of British knapsacks, blankets, and cartridge boxes in the winter camps of the struggling Army of Tennessee. A unique depiction of a perilous trade, this record sheds a dramatic light on the surprising pervasiveness of imported war material as well as the effectiveness and sophistication of the Confederate supply system. Charles L. Webster III is a historian specializing in the American Civil War and a practicing lawyer. He lives in Houston, Texas. CWL: Entrepot: Government Imports into the Confederate States is to be released the fall and Ray Flowers of the Fort Fisher Historic site states that the book is reader-friendly, well written and researched; Webster answers questions too long unanwsered. Stephen Wise, author of Gate of Hell: Campaign for Charleston Harbor, states that it is a book that rewards researchers, historians, and enthusiasts; this study that considers the impact of military supplies and the logistical system of the Confederacy will stand as valuable resource. 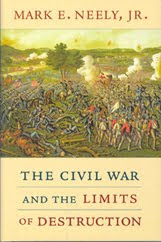 Let me begin my review of this very fine book with a small confession: as a European military historian and university professor, I sometimes take a certain pleasure in puncturing my students' boundless enthusiasm for the U.S. Civil War (always within the boundaries of fun, respect, good taste, and classroom decorum,the need to preserve their youthful "self-esteem," etc., etc.). Alright, alright ... I know it's unprofessional of me, but I just can't help it. They are so earnest, so in love with the war, or better yet so in love with a particular vision of it. They love the generals, or at least Grant and Lee. They love the heroism and the common folksiness of the soldiers. They love the uniforms. They love the belt buckles and the gear. 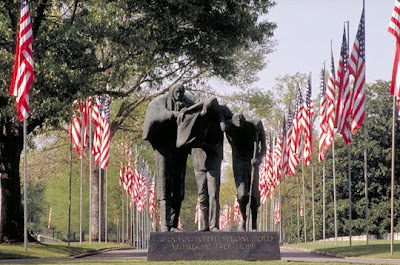 To many of my students, the Civil War is still the biggest war of all time, and the baddest, and the bloodiest. The better students even know that it's the first "total war," the first "modern war"--whatever those slippery phrases are actually supposed to mean. It is, in other words, nothing less than the best war ever, and even minor professorial criticisms of the generalship or fighting qualities of the troops on either side always leads to some in-class brouhaha. As a scholar of German military history, for example, I might mention in lecture that the Austro-Prussian battle of Königgrätz (1866) was more than twice the size of the battle of Gettysburg in terms of numbers of men engaged. Incredibly, this simple statement of fact, given merely to lend scale to the event under discussion by reference to something the student already knows, almost always leads to a certain amount of student spluttering, of the "Yeah, but ... " or "So what?" variety. Apparently, Gettysburg was the biggest battle of all time, and to hint that there may have been a bigger one just a few years later actually seems to many young Americans to be an insult. And this is one of the many reasons why Mark Neely's The Civil War and the Limits of Destruction is so fascinating. It marks a culmination point of sorts in a new strain of civil war historiography--with nods to previous research by Joe Glatthaar, Mark Grimsley, and others--that questions the widely accepted notion of an unrestrained Civil War. Now enshrined in American history textbooks at all levels, the traditional narrative goes something like this: in the course of the war, the military gloves gradually came off until all-out "brutal" or "hard" war on civilians became the norm on both sides, either in vicious guerrilla fighting in Missouri, or in Phil Sheridan's destruction of the Shenandoah Valley, or, of course, in Sherman's infamous march to the sea. Neely is unconvinced of all this. In six tightly written and well-researched chapters, he searches for a comparative dimension to the American Civil War. After all, the war's brutality can only be a relative thing, and one can only judge it in the context of other wars, preferably civil wars, of the nineteenth century. Neely gives us a scholarly _tour d'horizon_, moving back and forth in time and space: from the Mexican War to guerrilla war in Missouri, then back to Mexico for Maximilian's "black decree," back up to Sheridan in the Valley, out west to the Sand Creek Massacre (one of the first and only times that white-on-Indian violence received the designation "massacre"), then to the debate in the North over whether to "retaliate" for the horrors of Andersonville. Finally, the conclusion contains a particularly brilliant discussion of the fraught issue of Civil War casualties. When analyzed in this manner, it turns out that the American Civil War was not a particularly brutal one, that its violence was never quite as unrestrained or brutal as many modern historians make it out to be. Volunteer troops in the Mexican War, for example, routinely visited depredations on the local civilians that their counterparts in the later war would never have dreamed of doing. The guerrilla war in Missouri, which has become an obsession of present-day civil war historiography, is here cut down to size as one of a series of "sideshows" (p. 71) to the larger war; sure, generals were more likely to make hard war on guerrillas, but much of the fighting in Missouri (Price's Raid, for example) was of the conventional, force-on-force variety. 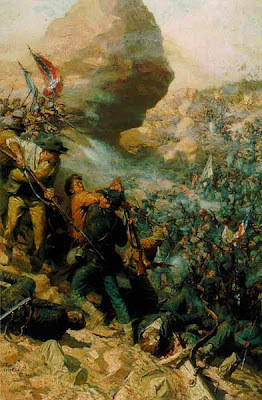 The civil war in Maximilian's Mexico was far more brutal than anything witnessed in the U.S. Civil War, with tens of thousands of liberales killed by the imperial government, their bodies hung upside down to rot as a warning to others who were loyal to Juarez. Sheridan's alleged burning of the Shenandoah Valley was actually a much more surgical operation than usually portrayed, destroying anything that the Confederate Army could use, but leaving civilian supplies, provisions, and dwellings untouched (which is why all the wheat was burned but almost none of the corn). A historian who wants a real burning should look not to Sheridan or Sherman, Neely tells us, but to the conflagration initiated on the Great Plains by the Union Army during the war, with Colonel Robert Livingston actually setting fire to the "prairie south of the Platte River Valley ... burning the grass in a continuous line of 200 miles as far south of the Republican River" (p. 147). As bad as it was, however, it had little to do with the alleged brutality of the Civil War. Another awful event, the revelation of horrific abuses against Union prisoners at Andersonville, complete with photographs that still shock the viewer today--with Union prisoners looking for all the world like inmates at Dachau or Buchenwald--led to some loose talk among Northern legislators about deliberately starving, shooting, or working to death Confederate prisoners in the North. But again, this is precisely what did not happen. Cooler and wiser heads prevailed, especially President Lincoln's, and none of these dreadful scenarios came to pass. Repeated assertion of the destructive nature of the Civil War may, in fact, serve only to remind readers of the provincial nature of American history-writing, since the world perspective from the Crimea to the end of the twentieth century would call into question the magnitude of the losses. The regular assertion of the death rate in the Civil War serves no end whatever. Rather than a deeper understanding of the conflict, historians are in danger of substituting "an empty cult of violence," perhaps the latest manifestation of Civil War sentimentalism (pp. 215-16). Finally, Neely manages to go beyond a mere accounting of the destruction in order to discuss the "why." Why was the violence limited? His thesis echoes the findings of earlier historians: good discipline and high motivation among the armies, Grimsley's useful notion of a "Federal citizen soldier" still guided by "the light of moral reason," Lincoln's moderation, ties of common religion, and more. In the end, however, Neely's answer boils down to race: when U.S. troops were fighting Mexicans, or Indians, or when C.S.A. troops captured African American soldiers at Ft. Pillow, then things really could get brutal. But when they were facing fellow white troops--and with their image of whiteness being reinforced constantly by the omnipresence of blacks in both North and South--they were much less likely to do something shameful. Here, I must confess to a certain unease. While the answer he gives certainly seems plausible in the context of American history, I found it asserted in the text more often than proven ("In other words, the true story is this: U.S. soldiers decided not to apply the lessons learned in the Indian wars to the enemy in the Civil War largely because the enemy in the Civil War appeared to be of the same race" [p. 153]; "More important, the United States did not really want to do such things to white people" [p. 167]; and again, on p. 219, "Honor and Christian charity had their place, all right, but it was a place reserved in that era mostly for white and 'civilized' belligerents". To be fair to the author, however, he is aware of the problem. Indeed, these sorts of deeply rooted presuppositions are among the most difficult things for a historian to establish, as anyone who writes cultural history soon finds. The historical actors rarely find the need to articulate them. After all, why write about an idea that one simply assumes to be true? Beyond that, however, Neely's emphasis on common race as the primary limiting factor in Civil War violence is problematic from the very comparative perspective that he employs here. There is another trope about civil wars, after all: that they are inherently the most brutal of all conflicts. In virtually all of them, the contending sides are of the same race, and yet they manage to slaughter each other with enthusiasm. Caesar's Rome comes to mind, as does Lenin's Russia, Pol Pot's Cambodia, and a host of others. Why would notions of common race work to limit violence in the American conflict, but fail to do so (and indeed, possibly even promote violence) in so many others? It is one of the many questions this fine book raised in my mind. The Civil War: American tragedy, American fate, a god-awful mess? Absolutely. "The bloodiest war in American history"? Perhaps not. and the Limits of Destruction_. H-CivWar, H-Net Reviews. August, 2009. The site of the Meade's Pennsylvania Reserve Division breakthrough of the Confederate right flank commanded by Jackson at Fredericksburg is now open with an interpreted walking trail. The 1.75-mile "Slaughter Pen Farm" trail takes visitors over some of the bloodiest ground on the Dec. 13, 1862, battlefield. 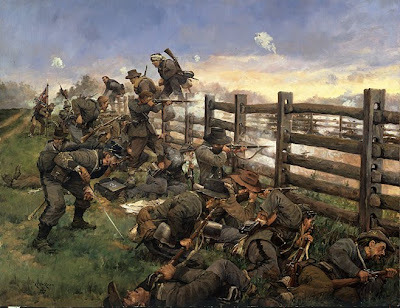 This assault over mostly open ground was supposed to be the main Union attack that day, with the now more famous assault on Marye's Heights to follow. More than 9,000 Federal and Confederate casualties were sustained on this ground south of Marye's Heights, giving the area its name. The property was acquired recently by the Civil War Preservation Trust (CWPT). Though recently and generically labelled "The Slaughter Pen" the farm fields are still part of a working farm. The entrance to the property is located just off Route 2 south of Fredericksburg, 11232 Tidewater Trail, Fredericksburg VA 22408. The Civil War Preservation Trust asks that groups of more than five register at the Fredericksburg National Park visitor center or with CWPT (800-298-7878) and to use caution since this site is still an operating farm. Here are the highly illustrated trail plagues. Here is the link for the animated maps. The units move according to the battle clock. Frank O'Reilly's ten minute orientation film is here. He presents the notion that Confederate authors emphasize the Stonewall beneath Marye's Heights where losses were 1 to 8 against the Federals. O'Reilly reminds the audience that the losses on this farm were 1 to 1, something the Southern authors wish to ignore. It was at this farm that Lee was gazing when he said to Longsteet, "It is well that war is so terrible otherwise we would grow to fond of it." Best results come with George Rable's Fredericksburg! Fredericksburg! or Frank O'Reilly's The Fredericksburg Campaign: Winter War on the Rappahannock nearby and open. 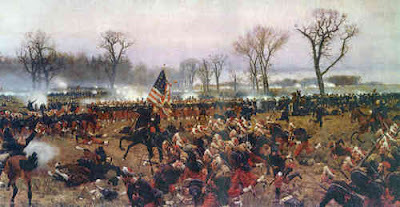 Image Source: The Assault of Meade's Pennsylvania Reserves is from fusiliers.wordpress.com. 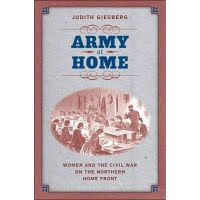 Army At Home: Women and the Civil War on the Northern Home Front, Judith Giesberg, University of North Carolina Press, 23 illustrations, 232pp., notes, bibliography, index, $35.00. Giesberg's book covers many aspects of women's lives on the northern home front: the female employees of U.S. army arsenals two of which exploded and killed their workers; handling the bodies of soldiers shipped home; being members of mobs that rioted in major cities; middle class women having to find employment; and widowhood with children in the cities and on farms. Introducing readers to women whose Civil War experiences have long been ignored, Judith Giesberg examines the lives of working-class women in the North, for whom home front was a battlefield of its own. Black and white working class women endured and conquered uncertainty, instability, and heart breaking losses. The demands of providing for families required women to manage farms, work in munitions and uniform factories, and tend to husbands who lost a leg or an arm. As women became more active in their new roles, these women became more visible as political actors by writing letters, signing petitions, moving from homes or resisting being tossed out on the street from their homes, and confronting civilian and military male authority. At the heart of the book are stories of women who fought the draft in New York and Pennsylvania, protested segregated streetcars in San Francisco and Philadelphia, and demanded a living wage in the needle trades and safer conditions at the Federal arsenals where they labored. Giesberg challenges readers to think about women and children who were caught up in the military conflict but nonetheless refused to become its collateral damage. She offers a dramatic reinterpretation of how America’s Civil War reshaped the lived experience of race and gender and brought swift and lasting changes to working-class family life. Giesberg examines the lives of working-class women in the North, where black and white working-class women managed farms that had been left without a male head of household, worked in munitions factories, made uniforms, and located and cared for injured or dead soldiers. As they became more active in their new roles, they became visible as political actors, writing letters, signing petitions, moving (or refusing to move) from their homes, and confronting civilian and military officials. Giesberg provides a dramatic reinterpretation of how America’s Civil War reshaped the lived experience of race and gender and brought swift and lasting changes to working-class family life. Text Source: The index and the cover flaps of the book. 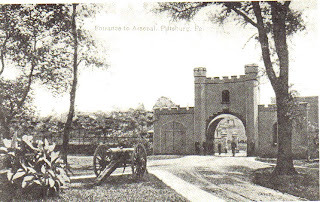 Image Caption: The Allegheny Arsenal where on September 17, 1862 seventy-eight workers, mainly women and children, were killed by an explosion. General Grant was asked how he ranked Jackson among soldiers. " I knew Stonewall Jackson," said the General, " at West Point and in Mexico. At West Point he came into the school at an older age than the average, and began with a low grade. But he had so much courage and energy, worked so hard, and governed his life by a discipline so stern that he steadily worked his way along and rose far above others who had more advantages. Stonewall Jackson, at West Point, was in a state of constant improvement. He was a religious man then, and some of us regarded him as a fanatic. Sometimes his religion took strange forms—hypochondria—fancies that an evil spirit had taken possession of him. But he never relaxed in his studies or his Christian duties. I knew him in Mexico. He was always a brave and trustworthy officer, none more so in the army. I never knew him or encountered him in the rebellion. I question whether his campaigns in Virginia justify his reputation as a great commander. He was killed too soon, and before his rank allowed him a great command. It would have been a test of generalship if Jackson had met Sheridan in the Valley, instead of some of the men he did meet. From all I know of Jackson, and all I see of his campaigns, I have little doubt of the result. If Jackson had attempted on Sheridan the tactics he attempted so successfully upon others he would not only have been beaten but destroyed. Sudden, daring raids, under a fine general like Jackson, might do against raw troops and inexperienced commanders, such as we had in the beginning of the war, but not against drilled troops and a commander like Sheridan. The tactics for which Jackson is famous, and which achieved such remarkable results, belonged entirely to the beginning of the war and to the peculiar conditions under which the earlier battles were fought. They would have insured destruction to any commander who tried them upon Sherman, Thomas, Sheridan, Meade, or, in fact, any of our great generals. Consequently Jackson's fame as a general depends upon achievements gained before his generalship was tested, before he had a chance of matching himself with a really great commander. No doubt so able and patient a man as Jackson, who worked so hard at anything he attempted, would have adapted himself to new conditions and risen with them. He died before his opportunity. I always respected Jackson personally, and esteemed his sincere and manly character. He impressed me always as a man of the Cromwell stamp, a Puritan—much more of the New Englander than the Virginian. If any man believed in the rebellion he did. And his nature was such that whatever he believed in became a deep religious duty, a duty he would discharge at any cost. 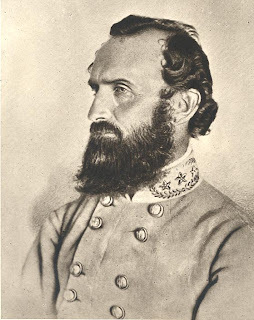 It is a mistake to suppose that I ever had any feeling for Stonewall Jackson but respect. Personally we were always good friends; his character had rare points of merit, and although he made the mistake of fighting against his country, if ever a man did so conscientiously he was the man." Text from Around the world with General Grant By John Russell Young, pages 210-211. 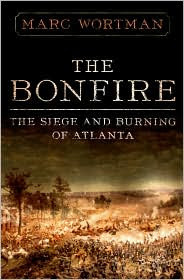 The Bonfire: The Siege and Burning of Atlanta, Marc Wortman, Public Affairs Press, 352 pages, $26.95, August 2009. The capture of three great Southern cities were turning points in the American Civil War. The capture of New Orleans in April 1862, the most populated and prosperous city in the Confederacy put Europe on notice and plugged the Mississippi River's Gulf of Mexico and trans-Atlantic trade. The capture of Atlanta in September 1864 put the electorate on notice that the war was being won and that there was a light at the end of the tunnel. 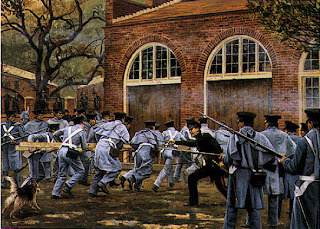 The capture of Richmond during the first days of April 1865 routed the Confederate civil government and put it flight. Recently, Atlanta's Civil War history has received attention In particular, Secret Yankees has revealed that the Northerners that founded the city and lived there remained loyal to the Union and supplied a vast amount of intelligence on commissary stores and troop movements. Marc Wortman offers Bonfire: The Seige and Burning of Atlanta which provides the story of Atlanta from its founding in the 1830s to its burning in the fall of 1865. IN reviewing the index and the first several pages, Wortman's narrative appears to be character driven and accessibly written. Noted historian, Debby Applegate reports that Wortman offers "extraordinary original research" and "vivid prose and old-fashioned suspense." Wortman is the author of The Millionaires’ Unit: The Aristocratic Flyboys Who Fought the Great War and Invented American Air Power, now in development as a feature film. An award-winning freelance writer, his work has appeared in numerous national magazines. He has taught literature and writing at Princeton University. The destruction of Atlanta is one of the two epic moments in the film Gone with the Wind. A third epic moment occurred in 1970 when the film was released in major theatres and to my shock and dismay Nancy, my date, burst into tears at the scene where Scarlett is the most broken and then becomes the most resilient. Well, . . . it was an epic moment in my life. Looking at the stack of soon to be read books on the floor next to my desk, Wortman's Bonfire is next; by the length its bibliography and the first several pages, it looks like one that I might wish to read a second time. On Sunday night October 16 1859, nineteen men began a short five-mile march from a rented farmhouse to the U.S. factory and arsenal at Harpers Ferry, Virginia. Their goal was to seize weapons and hostages and retreat to the highest peaks of the Appalachian Mountains where a permanent trail heading northward would be established. By Monday morning most of the arms had been seized and the hostages taken. The plan was to leave at dawn but they stayed, were besieged and captured by Tuesday morning. During that time, rumors of a slave revolt spread and apprehension accompanied by fear spread outward from Harpers Ferry. For the past 150 years, questions about Brown have plagued historians. 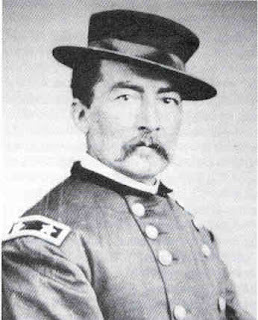 Stephen Oates, considered by many to be Brown’s best biographer, explained Brown’s raid as an effort by a religious fanatic who relied on God for the plan and its outcome. Indeed, Brown was deeply religious and fanatical regarding the abolition of slavery. Religion in several of its varieties may be a catalyst for violence for the purpose of vengeance, and judgment. But religion in and of it self is not an explanation for Brown’s taking his chosen path to the gallows. Rigorously pious, zealously abolitionist, and deeply egalitarian, John Brown believed that God and the U.S. was at war with slavery. Many of those who agreed with his notion of resistance to slavery did not accept, promote or call for violence. Brown’s plan was not revealed to him by God; it was Brown’s own and it was flawed. Beginning with the arrest and through the Civil War Brown was repeatedly described with Biblical metaphors. This is similar to the eulogies of Lincoln that relied heavily on Biblical images and stories. Brown saw his war against slavery as being similar to other wars found in the Bible. Both Brown and his surviving children reported that he never wrestled with God or received revelations regarding slavery. Brown did not claim to be a prophet or martyr. The possibility of failure at Harper’s Ferry was weighted against the relentless advance of a Slave Power that could not be defeated through democratic agitation and politics. In the flow of history Brown’s raid on the Harper’s Ferry armaments was poor tactics but a successful in terms of strategy. The raid induced a crisis of fear in the South, a crisis of unity in the Democratic Party, and a crisis of a minority presidency. These crises lead to a war that included emancipation as a tactic. By the third anniversary of John Brown’s raid the Preliminary Emancipation Proclamation had been issued. The battle at Sharpsburg Maryland that allowed Lincoln to issue the proclamation was a day’s hike from the farmhouse that Brown had occupied until the late evening of October 16, 1859. Notes on reading of Robert E. McGlone, John Brown’s War Against Slavery, pp. 1-9. 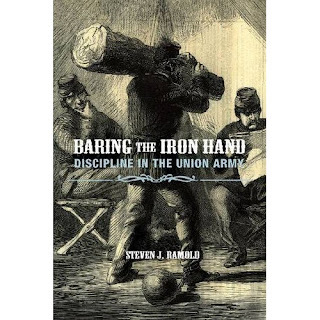 Baring the Iron Hand: Discipline in the Union Army, Steven J. Ramold, Northern Illinois University Press, 454 pp., notes, bibliography, $40.00, October 2009. Baring the Iron Hand: Discipline in the Union Army is an in-depth examination of internal conflict and discipline in the Union Army. During antebellum wars the Regular army preserved the peace, suppressed the Indians, and bore the brunt of the fighting. The Civil War, however, brought an influx of volunteers that overwhelmed the number of army Regulars, forcing a clash between traditional military discipline and the expectations of citizens. Baring the Iron Hand provides an extraordinarily in-depth examination of this internal conflict and the issue of discipline in the Union Army. Ramold tells the story of the volunteers, who, unaccustomed to such military necessities as obeying officers, accepting punishment, and suppressing individuality, rebelled at the traditional disicpline expected by the standing army. Unwilling to fully surrender their perceived rights as American citizens, soldiers both openly and covertly defied the rules. They challenged the right of their officers to lead them and established their own policies on military offenses, proper conduct, and battlefield behavior. Citizen soldiers also denied the army the right to punish them for offenses like desertion, insubordination, and mutiny that had no counterpart in civilian life. Ramold demonstrates that the clash between Regulars and volunteers caused a reinterpretation of the traditional expectations of discipline. The officers of the Regular army had to contend with independent-minded soldiers who resisted the spit-and-polish discipline that made the army so efficient but also alienated the volunteers' sense of individuality and manhood. Unable to prosecute the vast number of soldiers who committed offenses, professional officers reached a form of populist accommodation with their volunteer soldiers. Unable to eradicate or prevent certain offenses, the army tried simply to manage them or to just ignore them. Instead of applying traditionally harsh punishments for specific crimes as they had done in the antebellum period, the army instead mollified its men by extending amnesty, modifying sentences, and granting liberal leniency to many soldiers who otherwise deserved the harshest of penalities. Ramold's fascinating look into the lives of these misbehaving soldiers will interest both Civil War historians and enthusiasts. Phantom limb syndrome, post-traumatic stress disorder, facial reconstruction and brain and eye surgery all are the product of a battlefield. The first concerted response to such wounds occurred during the Civil War in the United States. "This was a time before doctors used microscopes, before they understood germs. Many of their practices would be appalling by today's standards, but this is what they had to work with," said Rea Andrew Redd, who will be the featured speaker at the Civil War Roundtable Aug. 13, in the Kara Alumni House at California University of Pennsylvania. 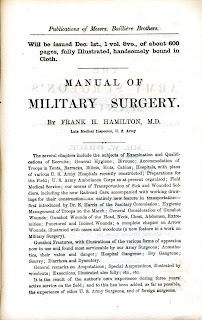 During Redd's address, "Gangrene and Glory: Medical Care During the American Civil War," he will provide an overview of medical practices and advances made and detail the work of a Federal regimental surgeon. "Actually, the Civil War turned into a complete medical laboratory," Redd said. "Doctors had an abundance of bodies to which they could apply their medical studies of the skeletal, muscular, and circulatory systems. In addition to being able to study aspects of brain and eye surgery due to soldiers' wounds, other wounds exposed the inner workings of the bones, the stomach, or other organs, enabling doctors to advance their knowledge of the human body." Redd, director of the Eberly Library at Waynesburg University and an adjunct instructor in history, brings an impressive Civil War resume to the roundtable: He made a 20-minute movie about journalism in the Civil War for the New York Times Web site and has performed at living history events at Gettysburg, Antietam and Harper's Ferry National Parks. The speaker said he has read volumes about the Civil War, but developed an initial interest in the conflict as a pre-schooler while perusing pictures in his older sibling's history books. His interest was so strong that his family claimed he had a Civil War gene in his DNA makeup. Two members of his immediate family, Samuel Redd and George Redd, were members of Company C, 140th Pennsylvania Infantry, Second Corps, Army of the Potomac. Both fought at Gettysburg and survived the war. Distant cousins from Virginia and Alabama fought for the Confederacy, providing significant fodder for interesting discussions at family reunions. To further his interest, Redd began to participate as a Civil War reenactor in 1993, with Company A, Ninth Pennsylvania Reserves. "At that time, the movie 'Gettysburg' was out, as was Ken Burns' Civil War series, and the tide was right," said Redd, 57, who resides in McMurray. "I found a group in its 12th year as reenactors, joined, and the group is still thriving." As a reenactor, Redd serves in the Union infantry, portraying a captain of medical services with the U.S. Signal Corps. He may drop rank to an infantry private or corporal or, as color sergeant, carry the regiment's colors. "Even though a popular school of thought is that medicine in the U.S. was inferior to that on the European continent during the mid-nineteenth century, that's not the case," he said. 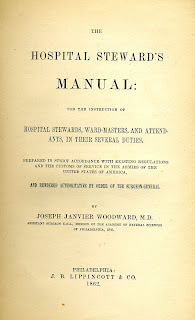 "Medical science in the United States at the time was as advanced and comparable to medicine being practiced in Europe. "There was talk about phantom limb syndrome and post-traumatic stress syndrome even during the Civil War era, plus there was even facial reconstruction occurring toward the end of the conflict. With photography rapidly developing, doctors were able to photograph many stages of surgery. Advancements in reconstructive surgery developed to the point where a soldier's jaw was rebuilt over period of three years' time." During the Civil War, there were appalling numbers of casualties accompanied by simultaneous and incredible medical discoveries, Redd noted. Because synthetic medicines were still non-existent, medicine was all herbal. After the war, he said, the discovery of vitamins would change the face of medicine. "As of 1862, there was plenty of chloroform for anesthetic purposes, and huge government contracts were awarded for its manufacture," he said. "As a result, the pharmaceutical industry was birthed during the Civil War." Chloroform was administered through a copper funnel with a sponge at the end; a soldier inhaled the chloroform before the operation. There was no shortage of chloroform during the war, in the North or South, and there was enough even on the battlefield, as long as supplies arrived with the troops. On those bloodied and corpse-strewn battlefields, the wounded received what medical care was available. Surgeons frequently wiped a knife, thick with blood following an operation, on their clothing, only to reuse that same surgical tool on the next patient. Northern medical personnel developed the use of the ambulance to remove the wounded from the battlefield, to perhaps a farmhouse two miles from the battlefield, which was where physicians performed amputations. Physicians, Redd noted, also speculated about blood transfusions, about getting new blood into a wounded soldier, but how was the question that puzzled them. Gangrene, the death of soft tissues leading to a loss of blood supply, was another problem frustrating doctors on the battlefield. Wounded soldiers faced chronic blood poisoning, and there were no X-rays to determine precisely what damage wounds caused, whether from wool (uniforms), leather or buttons, which often shattered and spread throughout wounds. This lead to gangrene and often forced multiple amputations. Amputation of a foot did not necessarily stop the spread of infection but resulted in amputation of a leg below the knee. However, infection would often lead to an entire leg being amputated, and the spread of gangrene often resulted in death, many times in a matter of days. Redd points to numerous advancements during the war. For the first time, dried vegetables were used to feed troops, and the first canned milk was sent to soldiers. "That canned milk, or bottles of milk, along with a little whiskey, often saved a soldier's life," he said. Redd's historical anecdotes have been related to middle- and high-school students, for historical societies, and at Soldiers and Sailors Museum in Pittsburgh. Redd has put on a stove-pipe hat to perform as Abraham Lincoln for schools and historical societies and at the Allegheny Cemetery. "Everything about the Civil War comes together, from the reenactments to historical research and stories," he said. "This is something I grew up with, and I enjoy sharing my stories with anyone who will listen." Redd has a Civil War blog at www.civilwarlibrarian.blogspot.com.